Recently a GM executive was quoted as saying that there are several key cities around the world where GM needs to do well and revitalize its brand. These cities include Los Angeles, CA, a region dominated by the Toyota Tacoma. The new Chevy Colorado is part of their strategy to compete directly with the Toyota Tacoma, the industry leader, in several key bellwether regions including California. Now that GM has a more centralized product line, it is looking for the new Chevy Colorado to go head to head with the Tacoma. This new model is based on its high-selling version in Thailand, the world’s largest compact truck market. 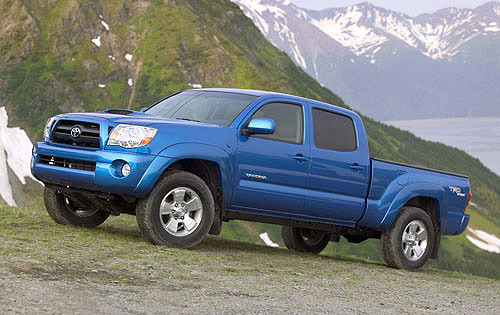 According to numbers released in September, the Tacoma is currently ranked 12 in vehicles sold in California. It is then no surprise that Chevy is reintroducing its small pickup into that market. There is a lot of room to improve for so-called “domestic” car manufacturers in California. In the third quarter, GM, Ford and Chrysler Group combined for 27.8 percent of the market share. While the other so-called “foreign” car manufacturers (Toyota, Honda, etc.) dominate the rest of the market. It should be noted that the Toyota Tacoma is manufactured in San Antonio, TX. The Colorado faces tough competition since the Tacoma is consistently named a EPA Best Fuel Economy Top Pick and Kelley Blue Book says it has a high resale value. It remains to be seen if Chevy can overcome its poor sales and engage a changing costumer base. It’s funny they want to compete… but check out their comparisons on the Colorado site http://www.chevrolet.com/color.....kup-truck/ They only compare themselves to Ranger, Frontier, and Dakota. If I were to think about moving out of my Tacoma, Chevy would have to make a better Colorado than in the past. The old Colorado was just to cheaply built. Funny how they don’t bother to list the Tacoma? I guess they figure there’s no point, LOL. Wow, its a good thing that the Colorado is a debranded ISUZU, ’cause gm can’t compete with Tacoma on their own. My last pickup was an S10, what a freaking total piece of gas guzzling garbage!